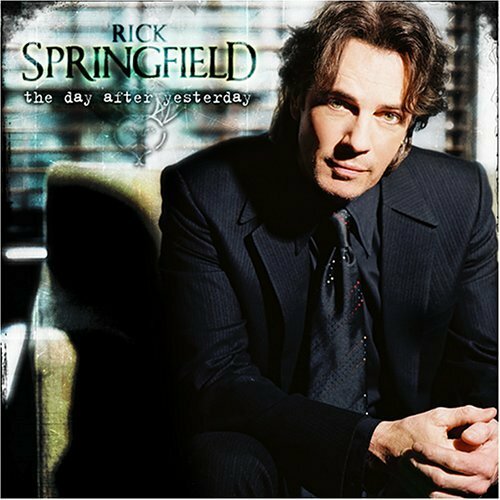 Jessie's Girl is probably a grandma now and the Working Class Dog is approaching retirement, but Rick Springfield keeps on keepin' on. Springfield's new album is called The Day After Yesterday, which was oddly also the name of Paul Giamatti's unpublished manuscript in the movie Sideways. I don't know if there is any significance to that, but I figured I'd mention it. However the title fits here, because the album is a group of covers of hits from Springfield's 70s-80s heyday as well as one original tune. Interestingly, Springfield is best known for his uptempo pop-rockers, but the songs he picked here tend to be on the more laidback side. He shows his way around a ballad in a way that hasn't really been been exploited except in a few tunes like "Don't Walk Away" and the great forgotten Randy Crawford duet "Taxi Dancing." Springfield's voice has gotten gruffer since his heyday (in fact the new recording "Blue Rose" sounds eerily like early Tom Waits), and that fits the battered romantic longing of the tunes. Any all-covers (okay, mostly covers) album depends on the strength of song choices. For the most part, Springfield has excellent taste � if sometimes a little unadventurous. This also extends to the performances, they are inevitably extremely well-played and sung, however they do tend to stick just a little too close to the original recordings. It would have been more interesting if Springfield added more of his own personality and quirks to the songs. Right now he sounds like a supremely capable cover band who is unwilling to rethink his material. For example, a cover of 10cc's wonderfully atmospheric romantic-rationalization "I'm Not In Love" is still supremely moody, however it suffers from the fact that the songs is just too familiar. Beyond the original being a soft-rock radio staple to this day, it has been covered to death over the years. Everyone from Tori Amos to Will to Power to Richard Clayderman to the Fun Lovin' Criminals to Richie Havens to the London Symphony Orchestra to Donny Osmond to the Pretenders have taken a swing at this chestnut and Springfield's version does not bring that much new to the table. A stripped down cover of John Lennon's "Imagine" also feels a little over-familiar and unnecessary. Copyright � 2005 PopEntertainment.com All rights reserved. Posted: November 24, 2005. Copyright � 2005 PopEntertainment.com. All rights reserved. Posted: November 24, 2005.